I guess I needed a little break as it’s been awhile since my last post. Now I am going to catch up! Back in May I went on a camera club field trip to visit some of the bridges up in New York City along with stops to the seaport area and a spot that had a great view of Manhattan. Unfortunately the light was overcast and the sky was uninteresting. Something needed to be done to spice things up so I bracketed some shots to create HDR images. It helped to make the scenes a bit more dramatic than they appeared in reality. 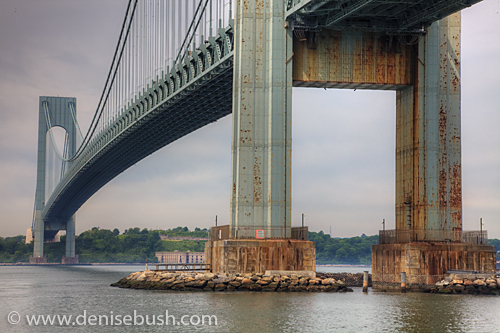 (‘VZ Bridge’ and ‘Across the River’ are both HDR images.) I also practiced my panoramas. The ‘DUMBO Pano’ combines 9 shots. (DUMBO stands for Down Under the Brooklyn and Manhattan Overpasses.) 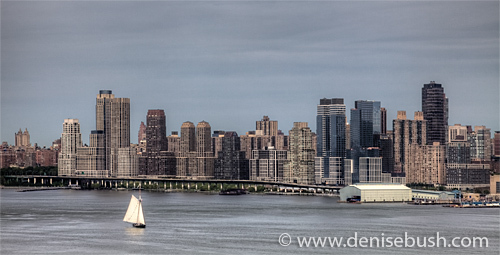 ‘Big Apple Panorama’ is over 100 inches long at hi resolution … big enough for a mural! Great captures, nicely presented. That sailboat…serendipitous. Awesome pano! Beautiful images and thanks for the great company. Cheers! Denise, these are beautiful. Big Apple is my favorite. Frame it and sell it. O M G !! These are fantastic . . . D . . . They REALLY portray the enormous scale! !